Yessiree, we all got spring early when many plants bloomed a month ahead of schedule. But I got one last blast with this Dutch iris on April 1. Guess it wanted to fool us. Peggy Martin is not fooling around this year. She’s finally got her feet in the ground to cover a trellis to hide the chain link fence. Thanks to William Welch, who discovered this Katrina survivor, and growers like The Antique Rose Emporium, I have this drought and flood-proof rose myself! It’s a little crazy out there right now with poppies, spuria irises, and Maggie rose to her left. Since Peggy and this Maggie were brought into the trade thanks to dear William Welch, I call it my Welch garden. Thanks to the Antique Rose Emporium, I have a young Republic of Texas rose, a low grower I’d planted in front of the den window. But she didn’t get as much sun as she liked, so I moved her in late February. In the back area, I’d already pulled out the border stones several feet and did the newspaper/mulch routine over former grass. I plopped her in this sunnier spot with little ceremony, and off she went! Some plants find the right spots for themselves. Years ago, Greg built this decomposed granite walkway alongside our carport. Gulf Coast penstemon (Penstemon tenuis) and Mexican feather grass seeds headed right over to fluff it up. Beyond represents some work on hold when I can snag a day. It’s not irrigated and never even gets a hose, so you’ve got to give them credit for making it through last year. In the backyard crape/mountain laurel island, the Knock Out rose deflects our attention from straggly poppies. I’ll resist the urge to tidy up for a few more weeks. It’s worth it to fill a bucket of poppy seeds to pass along. I love floppy, fluffy plants, but I love structural plants, too. Here’s my combination of Agave striata with ‘Hot Lips’ salvia. This week on CTG, we go for plants that stand up to drought and stand out in your garden with Michael Cain from Vivero Growers Nursery. For years, innovators Katherine and Michael connected with contractors and designers in the wholesale trade to toughen up landscapes in low-water times. In 2011, they opened to the rest of us with their fabulous nursery in Oak Hill, next door to Geo Growers. Here’s Katherine at the nursery. She wanted to come, too, but when you’re a mom and pop local nursery, someone’s got to mind the store! Tom and Michael showcase structural plants like agaves and echeverias to pair with softer forms and ongoing flowers. A new one to us is large leaf Jerusalem sage. No fooling, it’s a knock-out with super-sized leaves! Thanks to Katherine for all these great pictures! Have you ever considered Lion’s tail or Lion’s ear (Leonotis menthifolia) ‘Savannah Sunset’ that attract hummingbirds to stand-tall plants that hover with the hummers over foreground plants? At ground level, ‘Bath’s Pink’ dianthus entices with sweet fragrance. Its delicate silvery demeanor belies its drought-tough strength. Katherine and Michael work long, hot, hard days at their nursery. Then Katherine musters the energy to share her passion about plants, personable stories and great photographs on Vivero’s blog! I’m in awe. Daphne’s Pick of the Week, thryallis (Galphimia glauca) is certainly energetic as a structural screening shrub with flowers from spring to frost. Perfect to accent silvers, purples, and whatever your imagination throws your way! But I bet you’ve never imagined this on your oak trees. Please thank Larry Kuehn for bringing it to our attention! Daphne and I consulted arborist Guy LeBlanc who nailed it as crown gall. Find out what that means for your trees. It’s a great time to propagate plants! Get a few new tricks from Merrideth Jiles from The Great Outdoors, another fabulous local nursery that works online with great tips when they’re not online with you in person. 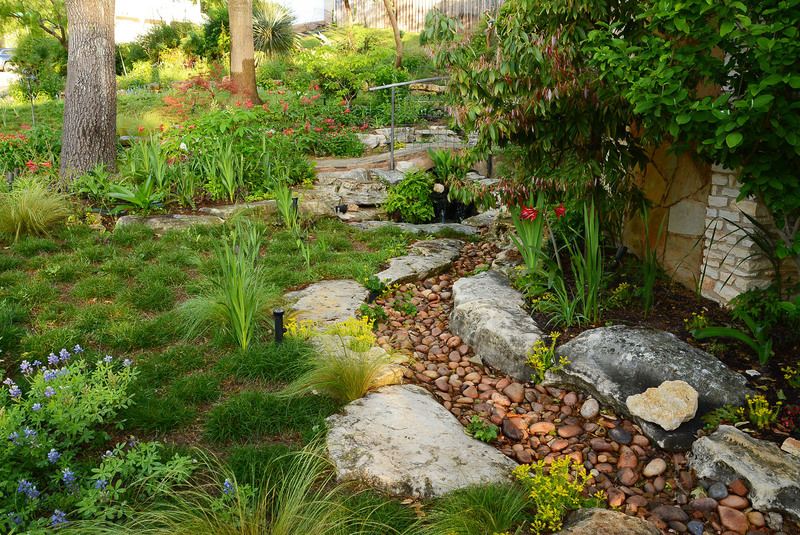 On tour, Paul Lofton in Pflugerville shows that you don’t need a ton of money to create a fabulous garden! Thanks to Matt Jackson for connecting us to Paul. Follow Paul on his Facebook page with what’s up in his garden. And, in his first time on camera, here’s his 1 minute tip on how to propagate a plant in a recycled soda bottle. Thanks to Paul, I now have a cobweb spiderwort (Tradescantia sillamontana) that he sent home with me in a bottle! Unlike its spring cousin, this one thrives in summer and takes a break in winter. ← My big reduce lawn renovation: before and after!